Fees are split up into three portions: a delegation fee (paid once per school attending), a delegate fee (charged for each individual delegate), and a chaperone fee (for each additional chaperone in excess of the ratio of one chaperone for every ten delegates). 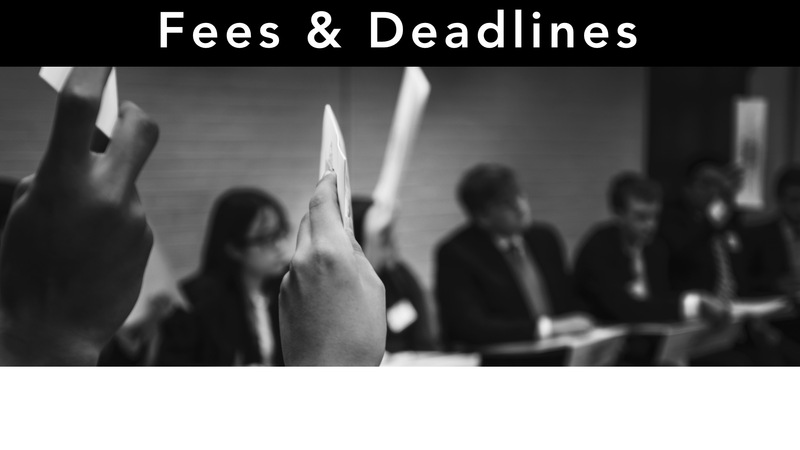 The delegation fee must be postmarked by the deadlines indicated below to complete the registration process. Schools that fail to pay the delegation fee by the Late Payment deadline forfeit their participation in the conference. Schools placed on our waitlist are not required to pay the delegation fee until they are offered a spot at the conference. Shuttle fees are $18 per person. More information regarding shuttles can be found here. Delegation fees must be submitted by this date to avoid being charged the late payment rate for all fees (including delegation, delegate, and chaperone fees). After this date, delegations will be charged at the late payment rates indicated above.